If you’re thinking of Bled as the choice for your next meeting or event, in light of what you may have already seen or read we need to give you a further advance warning: the city is not just a vision of Alpine paradise, but it also has venues with a timeless elegance and that are incomparably unique with their stories, unusual locations, settings, culture and history. These selected venues are the finest that you can imagine and will cater to almost any taste, size and shape of event that you may wish to host. The venues of Bled have a history of hosting prominent guests. In the 19th and 20th centuries Bled was a summer royal residence that attracted many of the royal families on their vacation. At that time Bled was a favourite of the royals of Monte Carlo and has held a prestigious reputation ever since. In the 19th century and thanks to Arnold Rikli Bled also became recognised for its healing natural outbuildings and became a health resort destination. In the inter-war period Bled remained the most cosmopolitan resort in Yugoslavia and the summer residence of the Karađorđević dynasty, visited by many domestic and foreign guests. It therefore became the centre of political and diplomatic life in the summer months. After the Second World War, the city continued its tourist tradition and renovated the majority of its restaurants and tourist and recreational facilities that are were switched into Slovenian hands. Given the presence of Tito’s residences in Vila Bled, the city was visited by many statesmen, politicians and cultural workers from the country and abroad. Vila Bled has now been converted into a hotel of the highest category and can accommodate even the most demanding guests. 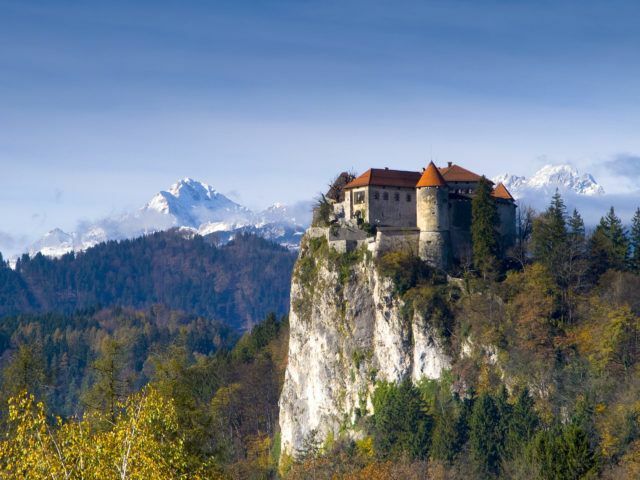 Perched atop a steep cliff and built over two levels, is according to written sources the oldest castle in Slovenia, first mentioned in a 1011 donation deed as castellum Veldes. Despite the fact that castle dates back to the 11th century, most of what stands there now is from the 16th century. The castle was the seat of the Bishops of Brixen for approximately 800 years, although they never resided there. In 1511 the castle was heavily damaged by an earthquake and was later restored and given its present appearance. Given its strategic geographic location, Bled has always been an important venue of high–level political and other official meetings. Its castle has been visited by a number of high-ranking statesmen who have enjoyed the breathtakingly beautiful views of the surrounding landscape. Adding to the everlasting allure of the town, you can reach it on a traditional wooden »pletna« boat, with upright boatsmen propelling their oars, or even take a punt on rowing yourself – it’s up to you. On docking at the island, there are 99 stone steps leading to the Church of the Assumption. The island is a great choice for a sparkling aperitif before dinner at the castle, but before leaving the island don’t forget to ring the church bell – according to legend it will make your wishes come true. Surrounded by a large park and sat on the shore of Lake Bled, is one of Bled’s most attractive cultural attributes. With a great location as well as a view to the castle and the island, and nowadays also with its boathouse and swimming pool, the villa reflects the characteristics of its former Viennese architecture and at the same time is reminiscent of the English villa. On the same site once stood the holiday chateau of the prominent Austro-Hungarian noble family Windischgrätz, with the Yugoslav royal Karađorđević dynasty later on choosing the villa for their summer residence. In the era of the second Yugoslavia, the new government arranged a government villa there and it became one of the residences for Josip Broz – better known as Tito.Today, this former presidential residence is synonymous with hospitality, comfort, timeless elegance, a superb culinary offer and unforgettable experiences, offering 31 rooms, apartments, suites and a presidential suite. On the Vila Bled estate one can also find the Pavilion Belvedere, constructed to the building plan of the greatest of all Slovenian architects, Jože Plečnik. This space where Tito once welcomed his guests remains a place for socialising and goes by the name of the Belvedere Café. Next articleBest Event Awards: deadline extended until September 15!